The word 'Kovia' derives from the Inuit Eskimo word 'Koviashuvik' which means, "Living in the present moment with quiet joy and contentment." Tom Laughlin specializes in discovering the unique angle of a company or product. Combining creative flair with technical know-how, he produces and shoots award winning dynamic marketing material at a reasonable cost. Clients include CNN, ESPN, NBC, The History Channel, DirectTV, A&E, RealTV, PBS and more. 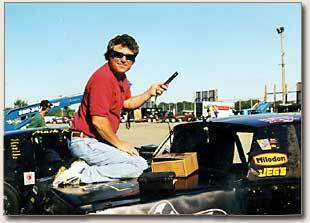 In this picture he is placing a Sony cigar cam in a stock car to record on-board footage of a legally blind driver racing against other blind drivers with the help of a sighted guide. The project was produced at the Lions Club annual night of fund raising stock car races and was for the corporate training world on the subject of teamwork and trust. For: Wisconsin PBS story on "How To Adopt a Child"